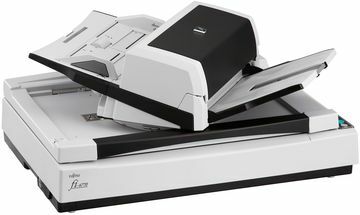 Extremely compact design features an automatic document feeder that can be rotated up to 180° giving wider options for positioning the scanner in the office. For example it can be placed against a wall or in a corner without affecting performance or reducing operational comfort. This also ensures equal ease of use for left and right-handed operators. 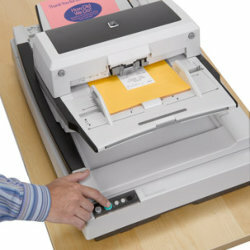 The fi-6770 comes loaded with features allowing the scanner to work autonomously as a true batch document scanner. Intelligent multi-feed function simplifies pre-scanning preparation and improves efficiency by identifying documents that tend to trigger false multi-feed alerts, such as documents with photos or sticky notes attached. Additionally, continuous uninterrupted scanning is achievable due to the fact that paper is fed from the bottom of the stack, allowing for more paper to added during the scanning process. The fi-6770 scans trapezoid-shaped documents across their full width, as well as ensuring that index tab and sticky note attached documents are scanned in their entirety. In addition, the fi-6770 removes the circular and angular punch hole representations that are created from scanning loose-leaf sheets, courier service forms and other similar documents. Straight paper path: virtually eliminates paper jams while permitting a greater diversity of paper types. Sealed optical units in the fi-6770 guarantee that image quality is maintained, even in the most demanding environments such as factories and warehouses. The fi-6770 can be used to apply virtual imprints onto the document images, including information about date and time of scanning. Automatic job separation: The patch code, bar code or 2D matrix code based automatic job separation function allows the scanner operator to have scanned documents automatically named or routed to their appropriate folders. Indexing: Scanning information including the matrix code embedded data can be logged in comprehensive index files for efficient post scanning processing. Seamless Microsoft® Office SharePoint® Server linkage: ScandAll PRO V2 Premium enables the fi-6770 to seamlessly link with Microsoft® Office SharePoint® Server for easy digitized document sharing and viewing administration. The result is even easier document management. The fi-6770 comes bundled with VRS Professional software, which simplifies the image capture operation and streamlines automated business processes. It allows information workers to focus on their productive tasks whilst at the same time supporting them by capturing information from paper documents at the click of a button. 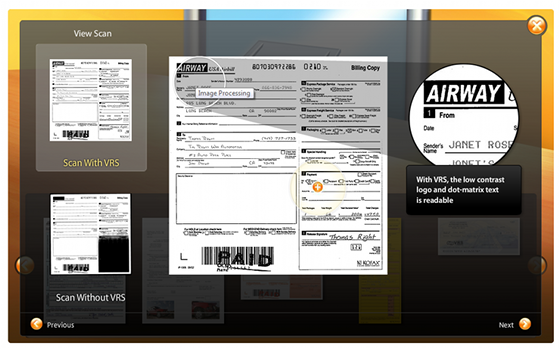 VRS dynamically adjusts scanner settings for each document, allowing for near-perfect image quality every time you scan. What is more, the advanced image enhancement technology of VRS Professional allows users to create images that are easier to read and index, making it easier to find, retrieve and use the captured information later on. Cleaning up scanned images in software makes for a huge improvement in the accuracy of your OCR and ICR software. Productivity is increased as well as efficiency resulting in a greater return for your scanning investment. Where higher VRS performance is required, our fi-6770A model offers a built-in a Kofax Hardware VRS board that optimizes image quality on the most difficult of documents. By performing advanced image enhancements in the scanner rather than in the computer, a higher scanning speed is obtained. Its ability to create sharper images from stained documents or documents with dark coloured backgrounds guarantees highly efficient scanning.